Artist's Talk & Reception: February 24, 2019, 2-4pm. 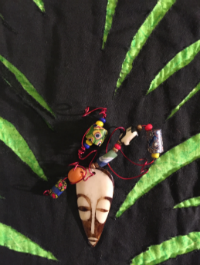 Asake Denise Foye Jones is a mixed media fiber artist, teaching artist, and transformative arts coach. Her sewing skills were honed while assisting her mother, Dorothy Foye (aka “Miss D”), in her Philadelphia, PA dressmaking business. Since 1995, Asake has taught and exhibited regionally, nationally, and internationally. She is documented in the books Communion of the Spirit and President Obama: A Celebration in Art Quilts and in Issue 73 of Types & Shadows: Journal of Fellowship of Quakers in the Arts. 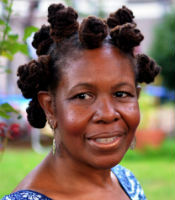 She has engaged in self-directed study and training at Fleisher’s Art Memorial and the Pennsylvania Academy of the Fine Arts in Philadelphia, the Neighborhood Arts Center in Atlanta, and the Cultural Center of Liberia in West Africa, among other places, including the following: Main Line Arts Center, Haverford, PA; University of the Arts and Artwell, Philadelphia, PA; and Build-A-Bridge Summer Institute for Arts and Transformation. Travel directions to Pendle Hill. Click to view the flyer. FAQs about Short-Term Education Programs (please read before calling). Click to view the Fall 2018-Winter 2019 Arts and Spirituality Programs brochure.